defining functions, overall size and sitable exhibits for a National Zoo within the context of ASEAN regional facilities. setting the most appropriate site from six locations suggested by government. prepare a Master Plan describing major components, circulation systems, operation and management of the zoo. describe costs, staging, funding and potential revenue for implementation of the Master Plan. Initial work involved establishing objectives and a functional brief for the zoo incorporating: a major leisure attraction; healthy environment for animals; facilities for scientific research; promotion of Conservation of the Natural World; and highlighting exhibits from the Indo-Malay region. The Key Concept for the Zoo is to provide a broad range of exhibits grouped in bio-geographic settings or Biomes, representing a selection of the ecotypes found across all global continents. Animals are to be presented in settings typical of their Region, and the Biomes are located on the selected site in reference to their natural geographic settings: Indo-Malay region is on forested slopes, Himilayas on high ridgelines; African-Savanah on the valley floor. 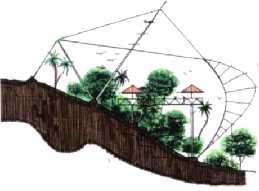 Special exhibits will create focal points within Biomes to present a specific genera: reptile house, aviaries, catwalks, monkey island, and an aquarium. Enclosures are defined by invisible or transparent restraints including moats, level changes, and reinforced glass.